• the impacts of interactions between climate change and changes in human use and management of ecosystems as well as other drivers of global environmental change. Guided by the above, the following research needs can be identified as priorities for reducing uncertainties. • Identify key vulnerabilities in permafrost-soil-vegetation interactions at high latitudes, and their potential feedback to the biosphere trace-gas composition. Recent estimates suggest that terrestrial permafrost contains more than 1,000 PgC, which is increasingly emitting CO2 and more importantly, methane (e.g., Walter et al., 2006; Zimov et al., 2006). 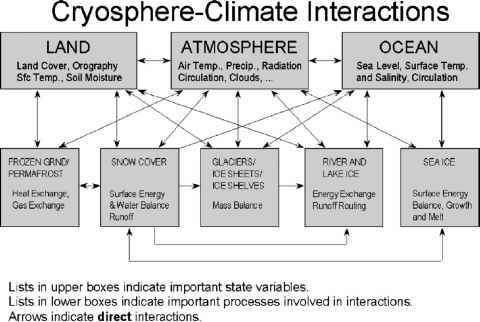 The implications of this for abrupt and significant climate forcing are significant (e.g., Schellnhuber, 2002; iLEAPS, 2005; Symon et al., 2005, p. 1015; Lelieveld, 2006; Zimov et al., 2006). • More robust modelling of interactions between biota and their geophysical environment using several independently developed DGVMs and Earth-system models. Validation (Price et al., 2001) beyond model intercomparisons is required, especially also with respect to the methane cycle. The goal should be to narrow uncertainties relating to the vulnerability of the carbon sequestration potential of ecosystems including more realistic estimates of lagged and threshold responses (e.g., Scheffer et al., 2001; iLEAPS, 2005). • More emphasis on precipitation projections (e.g., Handel and Risbey, 1992) and resulting water regime effects. These should emphasise interactions between vegetation and atmosphere, including CO2-fertilisation effects, in mature forests in the Northern Hemisphere, seasonal tropical forests, and arid or semi-arid grassland and savannas (e.g., Jasienski et al., 1998; Karnosky, 2003). • Improved understanding of the role of disturbance regimes, i.e., frequency and intensity of episodic events (drought, fire, insect outbreaks, diseases, floods and wind-storms) and that of alien species invasions, as they interact with ecosystem responses to climate change itself and pollution (e.g., Osmond et al., 2004; Opdam and Wascher, 2004). • Development of integrated large spatial-scale remote sensing with long-term field studies (May, 1999b; Krauchi et al., 2000; Morgan et al., 2001b; Osmond et al., 2004; Opdam and Wascher, 2004; Symon et al., 2005, p. 1019) to better address scale mismatches between the climate system and ecosystems (Root and Schneider, 1995). • Studies on impacts of rising atmospheric CO2 on ocean acidification, and warming on coral reefs and other marine systems (Coles and Brown, 2003; Anonymous, 2004), and widening the range of terrestrial ecosystems for which CO2-fertilisation responses have been quantified (e.g., Bond et al., 2003). • Validating species-specific climate envelope models by testing model projections against the plethora of range shifts observed in nature (e.g., Walther et al., 2001; Chapter 1). • Advances in understanding the relationship between biodiversity and the resilience of ecosystem services at a scale relevant to human well-being, to quote Sir Robert May (1999a): "The relatively rudimentary state of ecological science prevents us from making reliable predictions about how much biological diversity we can lose before natural systems collapse and deprive us of services upon which we depend." • Improve identification of environmental key factors influencing ecosystem structures that determine functionality and provisioning services of ecosystems together with quantitative information on economic impacts (including implications for adaptation costs - Toman, 1998a; Winnett, 1998; Kremen, 2005; Symon et al., 2005, e.g., p. 1019). • Integrative vulnerability studies on adaptive management responses to preserve biodiversity (including conservation and reservation management) and ecosystem services in relation to pressures from land-use change and climate change (Kappelle et al., 1999; Lorenzoni et al., 2005; Stenseth and Hurrell, 2005; Symon et al., 2005).